Dan Richer is a baker and chef, the owner of Razza Pizza Artigianale in Jersey City, NJ, and formerly owner of Arturo’s in Maplewood, NJ. After a life-changing trip to Italy, Dan dedicated his life to bringing the flavors he had discovered there back home. In 2011, Dan was named a James Beard Award Semifinalist, and shortly thereafter transitioned from the tasting menus which had earned him that recognition to the more specialized pursuit of creating pizza of the highest quality. He was named a Semifinalist again in 2016 and 2017. In addition to being a first-rate baker and pizzaiolo, Dan is a beautiful and kind person, and I have benefited from his generosity on more than one occasion. He is an inspiration to me and many others. In our conversation, we discuss the importance of taste memories, why natural fermentation produces better bread, and how to make a meatball which melts in your mouth. Justin Naylor: I’d like to begin by asking about something you’ve mentioned in other interviews. You skipped your college graduation and flew to Italy, and you’ve said that the food you tasted there was nothing like what you knew of Italian food growing up in New Jersey. How would you describe that difference, and how did it affect you? Dan Richer: The Italian-American restaurants I had experienced growing up were not formal, not fine-dining. We’re talking about places where you get a plate of pasta for $10. JN: Right, not places like Babbo. DR: Exactly. But it was all I knew. So, when I went to Italy, even the most basic foods – pasta and tomato suace, or pasta with meat sauce – blew me away. These are things I ate growing up, but it wasn’t until I went to Italy that I really saw a difference between gnocchi in the US versus gnocchi in, say, Florence. As a 21-year-old, it was like listening to a new piece of music for the first time. You’re experiencing the whole thing, all of its parts, mingling and not really being able to pick apart the dish. I didn’t know, for example, if there were carrots in the sauce or onions. I was experiencing the thing as a whole. I just knew it was different and I enjoyed it more. It was so delicious, so balanced. Just better, and at that time I couldn’t say why. JN: How do you understand it now? DR: It’s all about ingredients and technique. As cooks, we have ingredients and technique, and that’s all we have control over. We’re always trying to find better ingredients and to hone our technique, whether it’s for sauce making, or pasta making, or pizza making. JN: In the case of the gnocchi, what do you think was the disconnect between the Jersey gnocchi and the Florentine gnocchi? DR: Pure technique. [In Italy] they knew what it was supposed to taste like, and what the texture was supposed to feel like in your mouth. When you know what it’s supposed to be like, it’s easier to recreate it. I say it’s all ingredients and technique, but there’s one more thing: having a blueprint for what it should taste like. JN: Right on. What Marcella Hazan called “taste memories.” She didn’t cook a day in her life until she was well into her 30s, but because she had a lifetime of taste memories she was able to figure out what to do. DR: So, that first trip was really the beginning of creating taste memories for me. I didn’t know how or why, but I knew that I wanted to bring that to New Jersey. I wanted to understand why it was so good, and I wanted to bring that home with me. JN: How do you think Italian-American cooking lost that connection to the taste memories of cooking in Italy? DR: It’s like the telephone game thing, where over time things just change, especially when you mingle a lot of different cultures together over a long period of time. I’m not a food historian by any means, and I can’t trace its lineage. Honestly, it’s not my lineage; I’m not Italian-American. JN: So, you wanted to bring back something of what you had tasted in Italy, but first you had to learn and put in a lot of time in other people’s kitchens, because you had no experience. DR: Right, lots of time. But not even that much in kitchens. I had worked in restaurants since I was 15, as a busboy. Even then, I liked watching in the kitchen. But when I got back from Italy I learned mostly from books, TV, trial and error. Mostly trial and error, cooking every day of the week. JN: Any particular book or TV show that made a major impact? DR: It’s really hard to say. I was watching a lot of Molto Mario at the time. JN: That was such a great show. DR: Yeah. Phenomenal. It’s like super-controversial to even be talking about him these days. JN: I understand, but I think it’s important and I’m happy to talk about it. DR: I am, too. It’s part of my story. I was watching a lot of that show in college, and it was so influential that it convinced me to fly to Italy instead of going to my graduation. JN: [Laughter] So it was that show that did it! I’m not surprised! DR: Yes. Also, my cousin had an apartment in Rome and I had a place to hang out. JN: Eventually, you did learn and develop and you became quite accomplished. Before you opened Razza your focus was on preparing elaborate tasting menus, and you received significant recognition for that. But now you’re focused on foods as simple as pizza, bread, and butter. How did that evolution happen? DR: Well, they’re not simple; they’re so complicated! I spent about a month in Japan in 2006, learning about the culture and learning about the food. That was where I really saw specialization: taking pride in doing one thing and doing it really well. So, I don’t look at it as going from complexity to simplicity. Everything I do is absurdly complex, though on the surface it seems very simple. As you’re able to focus your time on doing one thing, you’re able to expose the complexities. JN: What convinced you to focus on bread? By bread, of course, I mean pizza as well. DR: I got into bread because I got interested in pizza. I started my first restaurant in 2006. I actually bought a failing restaurant. It had two wood-fired ovens, and it had a pizza recipe which I inherited from the previous owners. My focus there was on the tasting menus. We would close down the restaurant twice a week to do these tasting menu dinners, 6 or 7 courses. It was a lot of fun and I loved it. But it got to the point where pizza was at the core of the businesses, because we were using these two ovens the other five nights of the week. I wanted to make that great, and focus on that. JN: Because you can’t do everything, which is a hard lesson to learn. One that I haven’t really learned yet, but it’s important. DR: Honestly, it was after I got my first James Beard Semifinalist award that I stopped doing the tasting menus, right at the height of their popularity! DR: The James Beard announcement was in March or April, and we were booked until August. But it was at that moment I said, We’re done. This is it. Let me focus on the core of what we’re doing. JN: You also mentioned to me, when we met a few years ago, about the influence of Anthony Mangieri. DR: Yeah, he owns Una Pizza Napoletana and was the best pizzamaker in New York at that time. He came to the restaurant and I was just so ashamed of my pizza. JN: He didn’t come to a tasting menu? DR: No, the regular restaurant, [with] the terrible pizza recipe I had inherited from the previous owner. JN: [Laughter] Priceless. Did that make it clear to you that the pizza you were making didn’t represent who you wanted to be? Everything crystalized and you’re like, Now we gotta get serious about the bread. DR: Exactly. I was just so embarrassed by what we were serving that I wanted to learn more. It all stemmed from a curiosity to understand things and a desire to create a better product. JN: Had you had powerful pizza experiences in Italy at that point, or did that come later? DR: I still haven’t had many powerful pizza experiences in Italy! Some, but not many. JN: Maybe this is a good time to ask you to describe how pizza in Italy is different from pizza in the US, for those who have never been to Italy. DR: Well, all pizza is essentially a flat bread with some kind of condiments on top. JN: In that sense, pizza’s been around as long as there’s been bread. DR: Exactly. Throughout Italy there are a bunch of different styles. Of course there’s Neapolitan pizza. 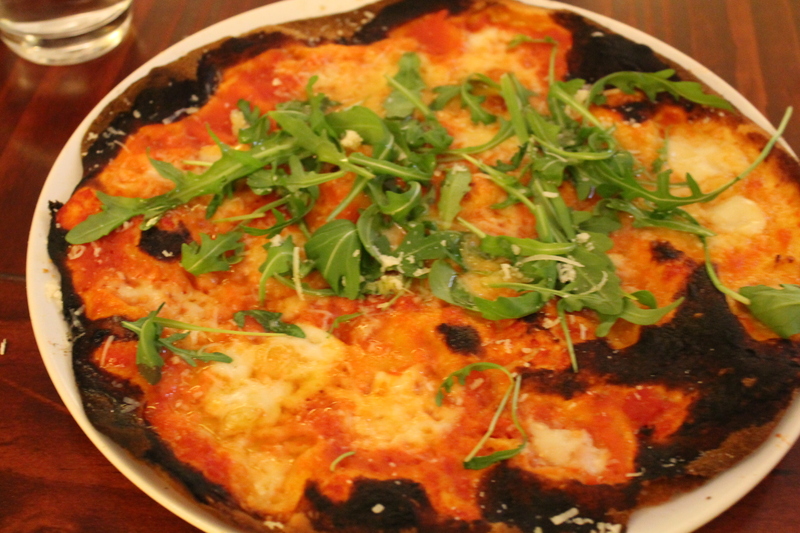 There’s super-thin-crusted pizza in Rome, rolled out with a pin. There’s pizza al taglio [by the slice]. JN: In terms of flavor, did you have the same kind of experience with pizza on your first trip as you did with pasta? DR: I had some pizzas that were certainly delicious, but I wasn’t as obsessed with the pizza on that first trip. JN: So, was Anthony [Mangieri]’s pizza a major inspiration? JN: So there weren’t that many resources. DR: Now it’s exponentially bigger. JN: Did you consider going to Anthony Mangieri himself for help, or did you not know him well enough? DR: Absolutely not. I knew him, kind of, but I would never ask him a question. He’s influenced me indirectly because of the embarrassment I felt about my product, but I’ve never learned anything from him specifically. I would never ask. Remember, this was 12 years ago. People were guarded about their information. If you wanted to know what kind of tomatoes someone used, you’d have to dig through their garbage, which is ridiculous. I would never do that. Instead of relying on specific information from others, I wanted to understand ingredients and techniques. With tomatoes, I came up with an evaluation system by speaking with tomato growers, canners, and discovering what characteristics tomatoes inherently possessed. You know, acidity, sweetness, texture. The seeds and the skins. Positive flavor attributes. Negative flavor attributes. I started rating tomatoes based on this system rather than relying on a specific region – like, the best tomatoes are from San Marzano – or on what kind of tomatoes a guy like Anthony Mangieri uses. I would never ask those questions or rely on that for what I would do. I’d use my palate and empirical data. You figure out what makes a good tomato and then do double-blind taste tests to determine which is the best. DR: For me, I wasn’t dead set on it being 100% natural fermentation and I’m still not. Every day I do side-by-side comparisons. 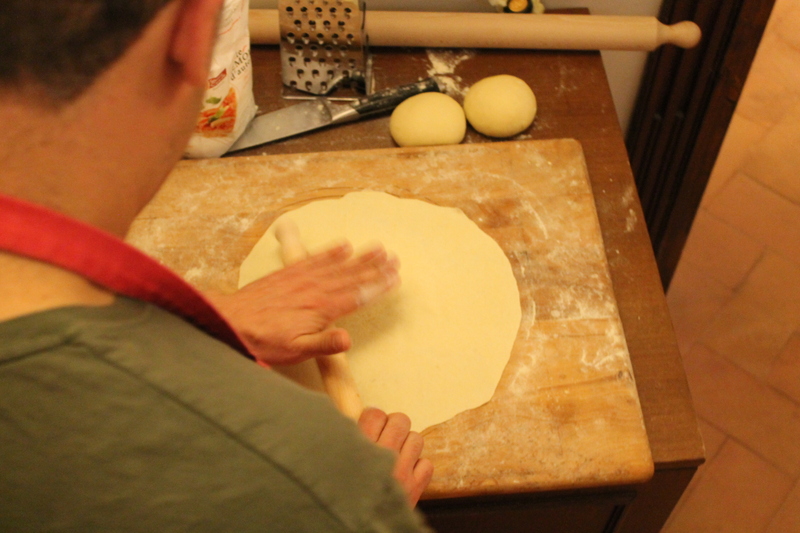 We usually have two or three batches of dough [at Razza]. One is 100% natural fermentation; one or two usually have varying levels of commercial yeast. All are less than the amount the French government says bakers can use and still consider the bread naturally fermented. JN: Really? I didn’t know you could use any commerical yeast in France and still call it natural fermentation. DR: You can, but we use much less, about 1/100 of a percent of the flour weight. JN: Like sulfites in wine, where good producers use way less than the amount they can use by law. JN: For those who don’t know the first thing about commercial yeast versus natural fermentation, how would you introduce that concept? DR: There are a few types of commercial yeast, but they’re all a single strain that metabolizes the starch in the grain – the starch being sugar. The yeast converts that sugar into carbon dioxide, which leavens the bread, and alcohol, which produces a little flavor but then burns off in the oven. With natural fermentation, we’re relying not on the single monoculture strain, saccharomyces cerevisiae, but on diverse wild yeasts and bacteria which we keep going through feeding a starter on a routine basis. I cultivated mine from wheat which I had grown for me in New Jersey. I got whole wheat berries and milled them by hand and mixed them with water, and I’ve been feeding them continuously for over 10 years now. JN: The key word being “yeasts” in the plural. Unlike commercial yeast, you have not a monoculture but an ecosystem. DR: Yes, and bacteria which live in symbiosis with the yeast. Keeping that culture – or ecosystem – healthy is the key to what we do here. JN: How would your bread be different if you followed the same process you use now, except you used only commerical yeast? DR: I don’t enjoy bread made exclusively from commercial yeast. I don’t think they’re delicous. JN: What are the flaws? DR: For me, it’s flavor: so much less complex using commercial monoculture yeast. When we do our side-by-side tests every day, and taste the 100% naturally leavened pizza compared to the batch with just a tiny tiny bit of commercial yeast, there is a dramatic difference in the flavor. Even the tiny amount of yeast we use can outcompete the yeasts and bacteria in the naturally leaved dough, and produces less flavor. However, it does produce more gas, and so we use a little bit. JN: So it’s a trade-off. DR: It’s a trade-off from a texture standpoint, because the one with a little commercial yeast always has a better texture – a little bit airier, a little bit crispier. We’re constantly having the discussion about the tension between flavor and texture. JN: For those who don’t know, how common is it to find a bakery that works with natural fermentation? DR: Extremely rare. Certainly, 99% of pizzerias out there use exclusively commercial yeast. Over the past decade it’s increased, and that’s awesome, but it’s still a tiny percentage. JN: Sometimes people ask me at my own bread classes why there is not even an attempt to capture the rich diversity of a natural starter in a commercial, dried product. Why is it a single monoculture strain? DR: I think that culture, in general – all culture – is fragile. Commercial yeast is very vigorous. It’s a vigorous gas-producer, it’s reliable, strong. It performs a function that is very important; it provides vigorous, reliable fermentation. Under low temperatures it doesn’t die, it’s great. Natural cultures, by contrast, are very fragile, and they need to be nurtured. If we’re talking about the culture of an organization, the culture of society, or a culture of micro-organisms, they need certain things. They have to be nurtured. There’s no possible way, in my opinion, to have this magic pill that captures all of those good things without any of the bad. The process of keeping a starter alive is not difficult, but it does require attention. All you have to do is feed it once or twice a day. It needs food and water. That’s it. So, we try to teach people about that. JN: When you make bread without the strain that’s in the commercial yeast, as you mentioned, it has fantastic flavor but it’s lacking a little bit of airiness. Why is that strain lacking in the natural culture? DR: You can get great gas production with 100% natural fermentation, don’t get me wrong. That’s the main job of a baker, to get great gas production from natural means. About the commercial strain not being more present in the culture… that’s a question for a microbiologist. I do know that that strain of yeast is non-reculturable. It doesn’t reproduce very well. So you can’t take it from batch to batch; eventually it dies out. Because the specific yeasts and the specific bacteria that are in our starter culture live in symbiosis together, they provide for one another. JN: For those who are ambitious, and want to do some natural bread fermentation at home, what tips do you have? DR: For natural fermentation, it requires constant attention. You are taking care of your culture, so if you don’t have the time to feed your culture, you should just not do it. JN: What about those who say, No big deal: throw it in the fridge, feed it once a week? In my experience, that produces a crap culture without vigor. DR: You can do that; if you feed it and then put it in a lower temperature, it’s fine for a week, a month, two months – but before you bake again, you have to feed it, you have to make it vigorous. I’m a big believer that if you don’t have time to do something, then don’t do it. DR: Three feedings, the more time apart the better. In an ideal situation – and this is not possible in a home baking situation – I would feed it three times a day at eight-hour increments. You can do it twice a day at twelve-hour increments, you can do it once a day, but the amount of old starter that you add to the new flour and water should be very low. JN: Any other tips to anyone at home who is trying to do natural fermentation, from your experience, that you haven’t seen in books? For me, the turning point was when I realized that the usual standard for commercial yeast – that you ferment until it’s doubled in bulk – was totally irrelevant for natural fermentation. DR: Completely irrelevant, yeah. There are so many things. I’ve been doing this since 2006, and I made my first pizza in 2003. It’s a lot of time of trial and error. I’ve learned so much. JN: Do you have a particular book that you recommend? DR: If you don’t have the time or dedication for natural fermentation, it’s Jim Leahy’s books: My Bread, or My Pizza. It’s super-approachable for the home baker. For natural fermentation, Tartine Bread is the baseline. If you want to spend the money, Modernist Bread just came out. I just bought it on Prime Day yesterday. It’s more expensive than my car! But totally worth it. I know the authors, for one thing, and there’s so much information in there. Just two chapters of it changed so much about how we make our bread. JN: That’s the mark of a real master: the more you learn, the more you realize that you need to learn, right? JN: I know this might make you a little uncomfortable or embarrassed, but was it last year that the New York Times said that you were the best pizzeria in New York? DR: That does make me a little uncomfortable. JN: Congratulations! But I understand; you’re a humble guy. Plus the idea of there being a “best” is kind of ridiculous; I get that. JN: But look at it this way: why do you think they honored Razza with that distinction? DR: There a couple of different reasons. Number one: if you did a double-blind taste test with our pizza and anything else happening in New York, I think you would see why, from what I’ve tasted. Of course, in New York there are so many different styles of pizza. Are we talking about a slice from Joe’s, are we talking about a slice from Prince St.? Is that what we do? No. There are so many different styles, so it’s difficult to rate. When I was coming up with our product, I took the data and the scientific approach and I came up with a list of about fifty characteristics about pizza that I love, and I worked every day – I continue to work every day – trying to be great at those fifty characteristics. It’s everything from the way the cheese melts, the way the cheese browns, the way the cheese spreads, to the sauce – all of those characteristics that we talked about in terms of tomatoes, those are part of the evaluation system for pizza. That’s what I think of as the best pizza, these characteristics. I also think that the writer of the review was trying to debunk the myth that location dictates whether your product is good, or not. A lot of people in New York have lots of not-so-nice things to say about us, just solely because we’re located in New Jersey. Whereas I feel that products are defined by their ingredients, their techniques, and the blueprints. JN: This is ironic, too, because a lot of these same people, when they go to Italy, are the very ones who say, We went to this place in this nothing of a town, and it was the most amazing thing! Why aren’t they applying the same principle here? If it’s good, it’s good. DR: Because people have a lot of pride. People have a lot of pride in New York, and New York has been one of the epicenters of pizza in the US. 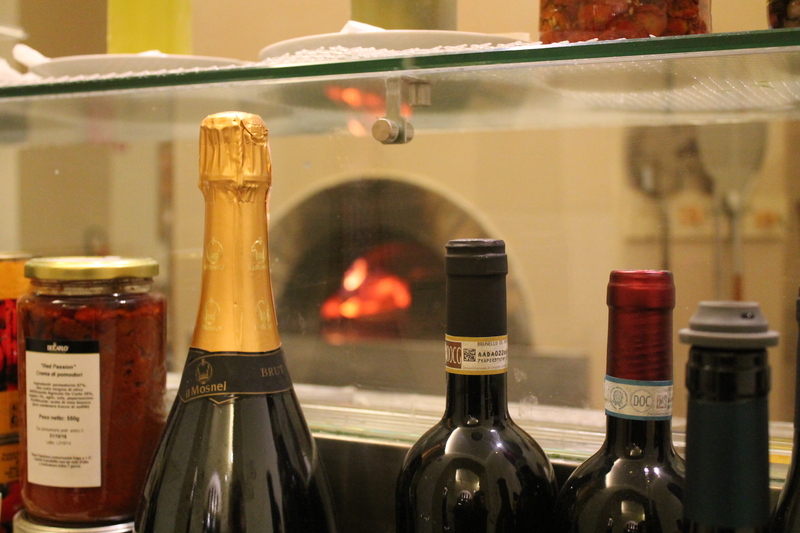 We have very strong feelings; we think that if a place has been open for a hundred years, that must be the best pizza. There’s something to be said for being open for a hundred years, but every day is an opportunity to make a great pizza or a not-so-great pizza. There’s no resting on your laurels; every day is a little bit different. That’s one of the things I love about pizza: every day is a little bit different. JN: I know you don’t want to speak ill of your colleagues, but why do you think others are not putting in the time and effort to make their product excellent, as you have done? DR: For a long time they didn’t have to. That’s one of the great things about the New York Times review: it got a lot of people thinking about it. When customers don’t demand a better product, there’s no reason for them to produce it. DR: While we have baloney. DR: I’m a big believer in the idea that location doesn’t make your product good or bad. You can have great pizza in Phoenix and you can have great pizza in Japan, and you can have great pizza here in Jersey City. JN: Speaking of great pizza, Anthony Mangieri of Una Pizza Napoletana, who so inspired you back in the day, is back from San Francisco and making pizza again in Manhattan. How excited are you that he’s back? DR: So excited. I went to the friends/family opening, and it’s phenomenal. It’s very Neapolitan, so different from ours. It’s better than any Neapolitan pizza that I’ve had in Naples. JN: How would you describe the difference between Neapolitan pizza and yours? DR: We are anti-Neapolitan, actually. Everything about Neapolitan pizza, we are not. Neapolitans are generally looking for something that’s baked in 60 to 90 seconds, which ultimately leads to a softer crust. They’re looking for something that has a little bit of resistance in your teeth, but that is light, airy, and soft. JN: I always compare it to the Indian bread naan, charred but soft. DR: Sure. Americans like crispy. We like crispy pizza. We eat it with our hands. Neapolitan pizza is soft and wet, you need a fork and knife. There’s something beautiful about that, and mopping up the soupy bits with your crust. That’s a great thing. But in the United States we slice our pizza into triangles typically, and we pick it up with our hands and we want it to shatter when we bite into it. We want it to be sturdy enough to not sag or droop when you pick it up. We’re part of an American artisanal pizza movement that’s happening here in the United States. JN: Does your pizza differ from Neapolitan pizza in ingredients as well as style? DR: Yes. 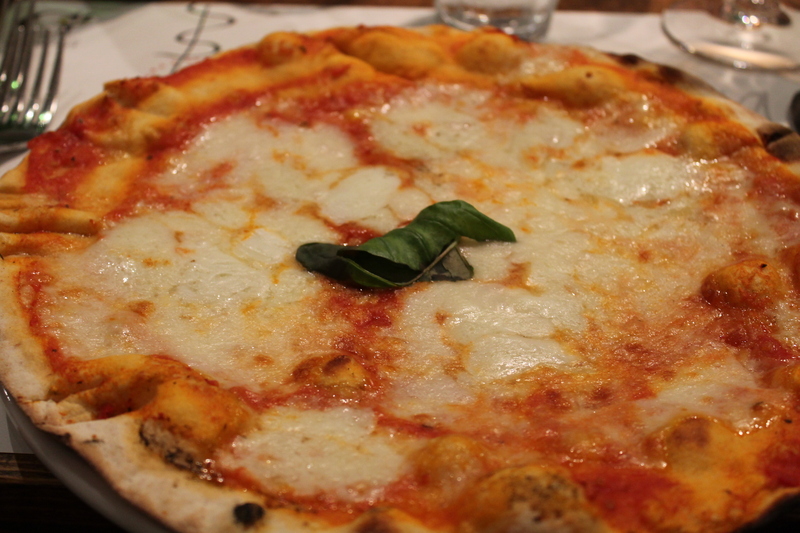 Neapolitan pizza uses only Italian products: bufala mozzarella, San Marzano tomatoes, Italian olive oil. That makes sense in Naples. But we’re in the United States, so we’re going to use tomatoes from the US – sometimes from California, but right now we’re testing the first Jersey tomatoes. JN: Those are the ones you were tasting when I arrived? DR: Yes, we were testing the specific gravity to see how the density would be and how they’d flow on the pizza. We’re taking the Italian ideologies and mentalities surrounding pizza and food in general, but applying it here. We’re using the ingredients that are right here. Use the ingredients available in your area, because that’s what makes sense, from so many standpoints, but certainly from a flavor standpoint. We don’t use buffalo-milk mozzarella because it’s meant to be eaten the day it’s made or the next day, so by the time it gets here it’s flat-out old. We don’t use 00 flour. It’s typically milled in Italy, but they don’t grow enough wheat, so they import the wheat, often from the United States. So [the US] ships it there, they grind it, and they ship it back. It’s a massive drain on our environment. I see something wrong with that. Why don’t we just find the mill closest to us, which happens to be 15 minutes away from here? That just makes sense to me. JN: What are you using for mozzarella these days? DR: We’re making our own. JN: So you buy the curd and stretch it? DR: Yeah, we have to. We’ve tried everything on the market. JN: What happened to the bufala producer in New Jersey? DR: They went out of business, even though the product was phenomenal. JN: And you were using it? DR: For all of last year. JN: So that’s the second US producer making an excellent product to go out of business; Woodstock Water Buffalo was the other. Why can’t they make it? Is there no market? DR: Oh, there’s a market. But the climate is too cold. They like heat; that’s why they’re all down near Naples in Italy. This past winter was really tough on the herd in Jersey. A lot just didn’t make it, and that was it. JN: Could you say a little about the flour you’re using, the one that’s milled locally? DR: We’re using a blend of two or three different flours right now. Our product is a living, breathing thing. Our process is always changing. There’s no saying, This is how we do it. Sometimes we’ll do it this way for a stretch of time, and then we’ll want to learn something else, so we’ll change one variable, like one of the flours in our blend, the water content of the dough by 1%, just to see what it does. We’ll change the fermentation temperature from 78 degrees to 73 degrees. We’ll change the feeding schedule of the starter. One variable at a time over a long period of time. So there’s no definitive answer about how we do it. JN: Although you have a great mill close by, have you ever thought about doing any in-house milling, as Marc Vetri in Philadelphia has begun to do? DR: You know, I could do that too. But would I do it well? Probably not. I could even harvest the clay from some soil here in New Jersey, make the plates, and serve my pizza on it. But I’m probably not going to be good at it. JN: So you’re not milling like they are at Vetri, but like Marc Vetri you’ve been critical of the term “farm-to-table.” Could you explain your opposition to that term? DR: I don’t like it because it’s a buzzword now, like the word fresh was ten years ago. It just becomes meaningless. McDonalds started using the world “fresh.” It’s just a stupid term for a philosophy that for me is ingrained in what I do. It’s the way things are supposed to be. If you want to eat food, eat food grown close to where you live. What’s foreign to me is putting all the farms in the middle of nowhere, growing one or two crops, and shipping the food to where the people are. It leads to so many detrimental things. It’s so terrible. JN: Is there a word or phrase that you prefer, or do you object to any description of the model you’re talking about? Because you want people to know that you’re doing something unusual, no? DR: I’d rather have them not know it. On our menu there is no mention of a specific farm or anything like that. We might talk about it. For example, if I get some strawberries from my neighbor and drive them up to the restaurant and put them on a salad, having never seen a refrigerator, we can talk about that with our customers. But we don’t have to say “farm to table” restaurant. JN: You’d rather have them just enjoy the product? JN: I guess it’s a little bit like European wineries eschewing the term “organic” on their label, even though they are organic. DR: Yeah, exactly. It feels like a marketing ploy. The most important part of what we do is creating a great product. It doesn’t matter where the ingredients come from. Everything else is secondary. The quality of the ingredients is the most important factor, and for me the best ingredients are local ingredients, but it’s not about being dogmatic. Everything else – the story behind it – comes second. JN: So, local is a means to an end rather than an end in itself. DR: Exactly. I don’t care about the marketing behind it. For example, my social media is almost non-existent. I’m not trying to sell us as a restaurant. JN: As in, you don’t have social media accounts or you just don’t care about it? DR: I just don’t care about it. I do it myself, but rarely, because it’s just not important to me. What’s important is the product and giving our guests a real product that’s genuinely delicious, and serving it in a way that is hospitable, caring, and warm. JN: Is your feeling about social media just a personal one, or are you making a broader generalization? In general, do you think social media has been a blessing or a curse to the food world? DR: I don’t think I’m smart enough to comment on it. All I know is that it doesn’t make me happy. It makes me happy to have my hands in dough, making pizza and serving that pizza to real guests in a real way on an everyday basis, not just snapping a picture of it and having people “like” it on my social media. That does nothing for me. Having a lot of followers does nothing for me. What makes me happy is the smile I get when a customer enjoys my pizza, and having a conversation with them about the pizza and about life in general. That’s what makes me happy. JN: I’d like to talk about the #MeToo movement as it relates to restaurants. We mentioned Mario [Batali] earlier, and about how many people don’t even want to talk to him or about him, as if he’s dead, which doesn’t seem to me like a healthy thing. Having worked in the business for some time, I’m curious if you have anything to say about this cultural moment? DR: Yes, it’s terrible. There are good people and bad people everywhere in every industry. The restaurant business is a high-stress environment. JN: Right. Low pay and high stress: not a good combination. DR: I think bad people should be called out, and when they make bad choices they need to be called out because it’s not acceptable to speak to someone in the wrong way or insinuate certain things. This stuff is ridiculous. I can’t even believe it’s a thing. It’s sad. JN: Do you think the cultural moment we’re in will lead to lasting changes in the industry? DR: People simply don’t want to be yelled at, or harassed, or any of that. We try to take care of each other and be there for each other. It’s amazing to me – I mean, I can’t even fathom people talking to me that way. I would never talk to anyone that way. It’s terrible. JN: We have just a few minutes left, but I can’t believe we’ve talked a whole hour without getting around to talking about butter. To some people, you’re just as famous for your butter as for your pizza. Could you describe how your decision to make butter came about? DR: Yeah. It came about because I was studying fermentation, and I wanted to ferment everything I could possibly find. I started making my own yogurt, then I realized I could make my own crème fraîche. I was making amazing bread and so I thought, Why am I not making my own butter? As we said at the beginning, pizza is bread with condiments. In a way, what is a simpler form of that idea than bread and butter? It’s like an even more simple version of pizza. DR: Obviously there are differences, but it’s the same idea. So I started sourcing the best cream I could find, a grass-fed cream from Pennsylvania that was just phenomenal. We use an heirloom Scandinavian culture, and it’s very similar to the sourdough bread process: we take a little of the fermented cream, add it back into the next day’s fresh cream to start the fermentation, and it begins to bacterially ferment the cream, lowering its pH and giving it a mild cheese-like tang. And then we churn it. So the butter really is alive and constantly changing. We keep it at room temperature, so even during the night we’ll see a change in its flavor from the beginning to the end of restaurant service. That’s something I love: the variety and variability. DR: It’s always delicious but it is subtly different. There are massive seasonal differences based on the grass and the diet of the cows the cream comes from. JN: Just to be clear for those who don’t know, culturing butter is extremely rare these days. Except for some of the imported European products, butter is made from cream which has never been inoculated. DR: Definitely. But in the past, before pasteurization, this is how all butter was made. The raw milk had naturally occurring beneficial bacteria in it which are killed by pasteurization, which is why we have to reintroduce them. JN: Why do you take the extra trouble to culture your butter? DR: Once you’ve tasted cultured butter, it’s hard to go back to sweet cream butter. There’s a massive difference in flavor profile. JN: When you started, was anyone else doing the same thing that inspired you? DR: There is now, but there wasn’t then. I mean, I certainly didn’t invent the idea. I’m sure people were doing it, but nobody I knew. For me it was just an organic, natural progression. JN: It really reminds me of what you said earlier about applying an Italian approach to an American practice. No one in Italy serves butter as a condiment for bread, but Americans do, so why not adopt an Italian mindset to an American practice? DR: Yes, without a doubt. JN: My final question is about meatballs. You and I share an affection for meatballs of high quality, and yet even in Italy it can be hard to find the best examples. Yours are some of the only I’ve had that really inspire me. Could you tell us what meatballs mean to you? DR: So, I grew up eating meatballs in a certain way. My mom made them. Were they phenomenal? Not really, but it’s all I knew. DR: Yeah, exactly. When I was in Parma, Italy, I went to a little take-out deli-type place. It had no tables, so we ordered some meatballs and they wrapped them up for me. I sat on a street corner in Parma, and I tasted this meatball that I had never tasted before. It was tender and melted in your mouth. It wasn’t dense. It was light and airy, not this compact, all-meat sort of thing. That meatball completely changed my view of meatballs. After that trip, I immediately started practicing meatballs, really picking it apart. How do you get that texture? What is a meatball? A meatball is a great way to use up some spare parts of meat that you have. Grind up whatever you have: beef, pork, whatever. Because meatballs are a dish of poverty, we take leftover bread, and that’s what lightens it up. So for our meatballs, since we have some day-old bread from our bread-making and since we have buttermilk from our butter-making, it’s just a natural thing to soak the day-old bread in the buttermilk and incorporate that into the meat that we have. Then we throw them on a tray and throw them in the brick oven because that’s the heat source we have. JN: Where do you think most people go wrong? Is it the common practice of using pulverized dried bread crumbs instead of fresh, soaked bread, or something else? I mean, it’s so sad that something that can be so delicious is more often so dreadful, even in Italy. JN: So it has some texture too? DR: Yes, and the bread is super airy, so it creates this negative space in your mouth. Like in a black and white photo. In the meatball you have the meat, but you need something for contrast. The bread is that negative space. When your teeth bite through it, you perceive that airiness — that negative space — in your mouth. JN: That’s such a great insight. Is there anything we haven’t talked about that you’re amped up to talk about? DR: I’m amped up to talk about anything! Especially food-related, science-related. I think that stuff’s awesome. But I’m so hyper-focused on one specific thing – making pizza – that I don’t feel qualified to comment on really big important things. I leave that to people who are really smart – like our friend Katie Parla. I can comment on pizza and flour and tomatoes. JN: Where do you like to eat these days when you’re not working? DR: I have a one-year-old and a two-year-old, so right now I’m eating at home pretty much every night! JN: Thanks again for your time, Dan. Can’t wait to return in a few minutes for dinner. There’s no place I’d rather eat right now than Razza. It’s just so good! About ten years ago I learned to make thin-crusted Tuscan pizza from Caleb Barber of Osteria Pane e Salute in Woodstock, Vermont, who had learned it in turn from a baker in Tuscany where he had apprenticed. So I was really excited when I first came to Rome five years ago to learn that Rome had a thin-crusted pizza tradition too. I always enjoyed pizza in Rome, even though one felt the quality wasn’t all that it could be. So I was delighted when I learned a few months ago about Emma, which really pays attention to high quality ingredients, including carefully made, naturally leavened dough. I’ve had a chance to eat there three times in the past two weeks and each time both the pizza and the suppli (rice croquettes with mozzarella) have been exquisite. The suppli were especially nice in a city which serves too many pre-made, pre-frozen suppli. Emma’s suppli are characterized by an especially intense, acidic tomato component. This type of pizza’s crust is so thin that it is rolled out with a pin instead of being stretched by hand. I’m not sure about the Roman version, but the Tuscan version I learned from Caleb is enriched by high-quality, aromatic olive oil, which keeps the crust tender, even while being shatteringly crisp. I taught my students to make it this morning, showing everyone not only how to make and handle the dough, but also how to produce pizza sauce which tastes of perfect tomatoes rather than the heavy, sugary junk that too often passes for sauce in the US. One of my students doing a great job. 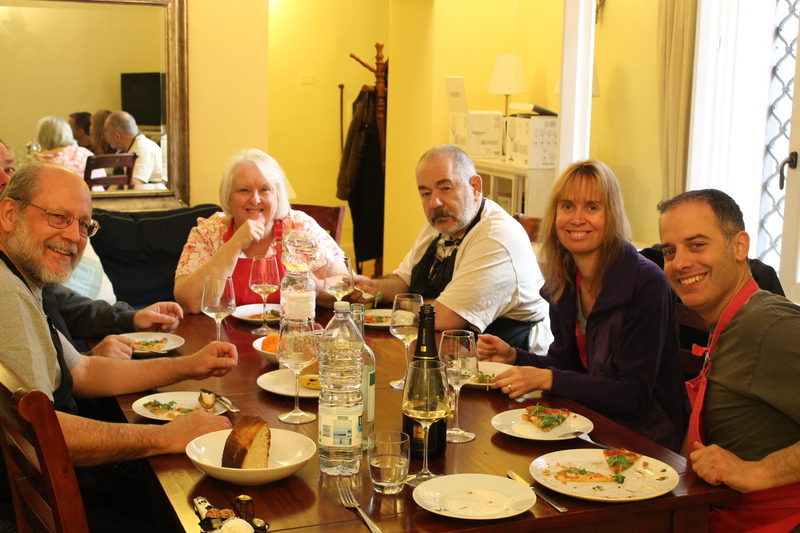 The other focus of the class was high quality mozzarella, which unfortunately is extremely hard to find in our part of northeastern PA, but which is ubiquitous in Italy. While the highest quality mozzarella is made in the countryside around Naples from the milk of water buffalo (mozzarella di bufala) there is also plenty of high quality cow’s milk mozzarella (fior di latte), both of which work well for pizza. I stressed the importance of balance and moderation, such a critical component of all good Italian cooking. This one got a little too charred, but in some ways it’s even better that way. After all of our breads and pizzas were made, we sat down to a delightful and leisurely lunch.